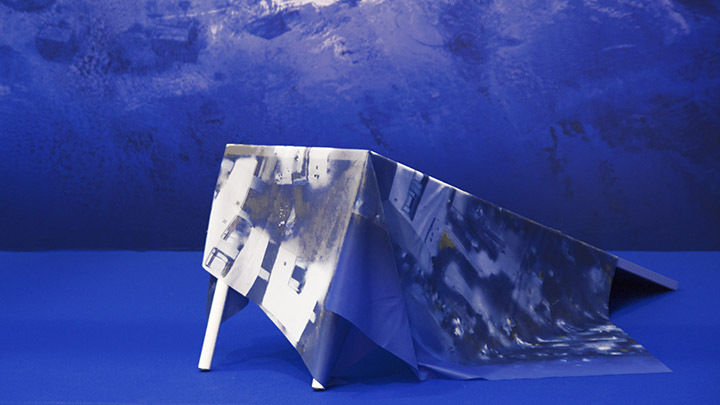 The Institut français in the United Arab Emirates, Cultural Department of the French Embassy, presents Gregory Chatonsky’s installation “ALT.CITY – Abu Dhabi”. 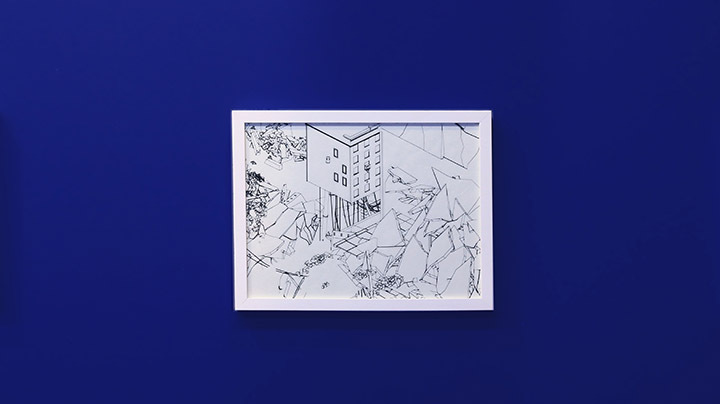 Mixing photography and virtual reality, the artist’s work invites us to immerse ourselves in a new perception of the city that questions our understanding of reality and virtually. 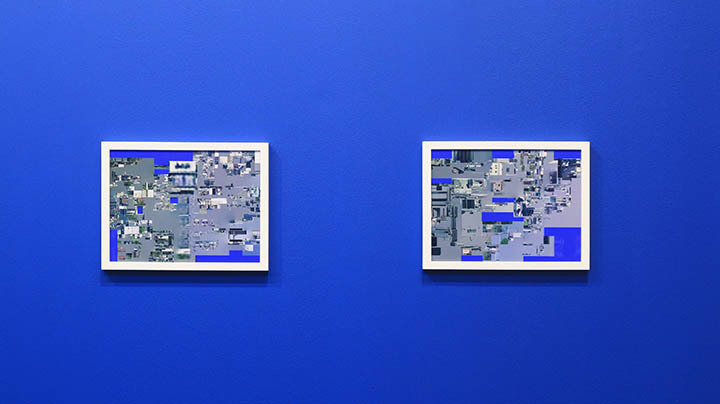 Based on on-site photography, cartographic resources and data available on the Internet, the artist creates new versions of Abu Dhabi. If this digitally generated city appears to be close to reality, it still differs in many aspects, triggering for the audience a feeling of both familiarity and strangeness. Through this installation, Grégory Chatonsky shakes our senses up in a digital environment that redefines the concept of territory. Everywhere in the world tremendously big projects see the light. Megacities get organized at a big scale modifying the life conditions of millions of people. Abu Dhabi is one of the main laboratories of this transformation of space and time. How can the residents own their spatial livelihoods? Is it possible to collectively make decisions about urban transformations? How can we predict the destruction of a place and the construction of another? This never-ending transformation of the city corresponds to upheavals that we can qualify by “post truth” or “alternative facts”. It seems increasingly delicate to establish a common reality as everyone seems to live in an isolated reality, whose common basis are vanishing. The best established facts are becoming doubtful. The most incredible accounts become then possible. Alt.City suggests to open a poetic space upon this reversal and immerses us in that imaginary world through virtual reality which explores an alternative version to Abu Dhabi. 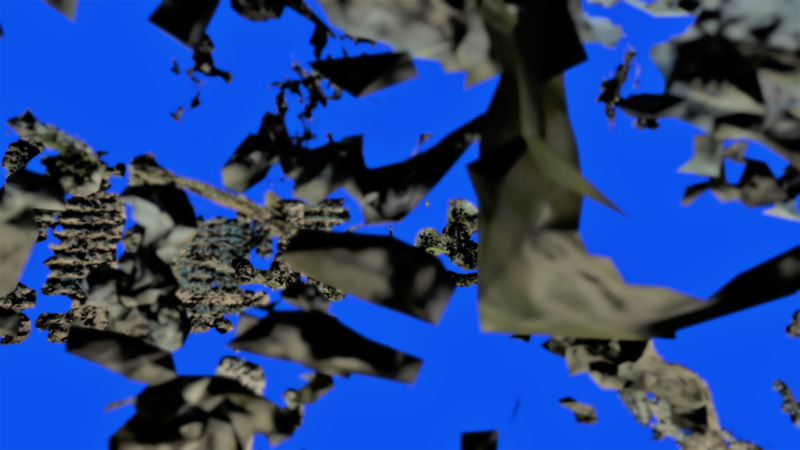 Based on thousands of photographs taken in the city by the artist, an imaginary version of the place is automatically generated by a computer that opens news possibilities of representation. Abu Dhabi becomes a generated image from the town’s real memory. A new vision, without ground nor boundaries, and devoid of any limit from above and underneath, the city appears to spread in all directions. The machine imagines another possible version of the city, another world, inspired from ours and fundamentally different at the same time. 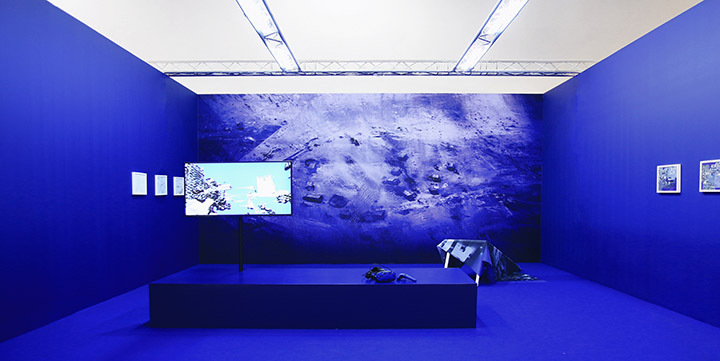 The installation is submerged in blue, a color usually used to make video inlays. 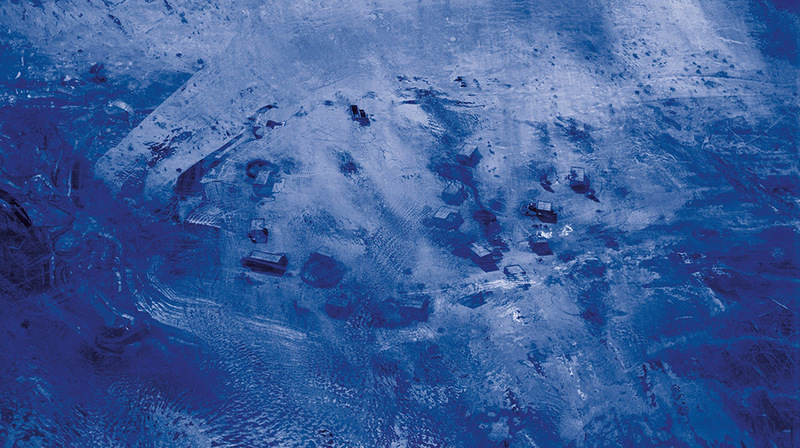 The color becomes the indication of a substitution, of a movement, of a shift from one space into another and a reference to Deep Blue computer. Alt.City – Abu Dhabi is the first version of a project that will be developed in other cities. The artist fed a network of artificial neurons called a “recursive neural network” with thousands of satellite photos thus creating an odd form of intelligence. The machine then creates images resembling reality. 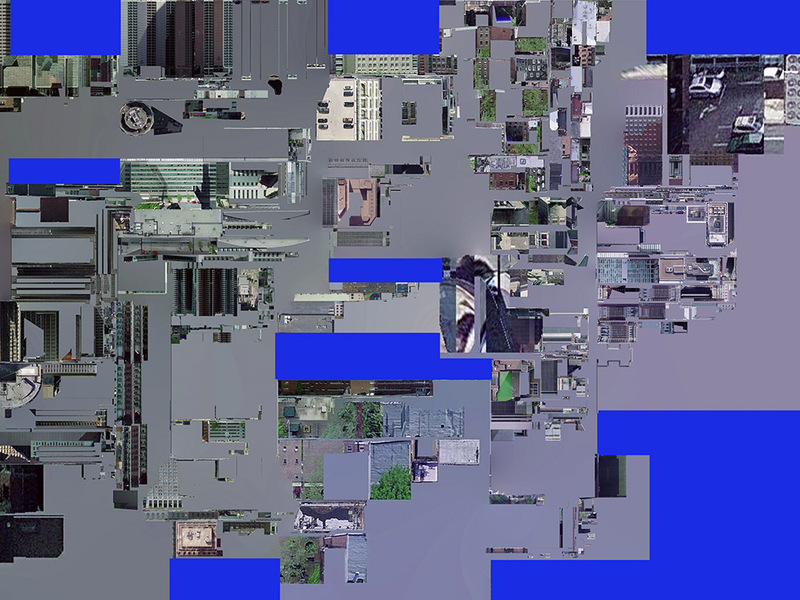 This illusion makes us wonder about the capability of new tools to independently create an imaginary city from existing data, memory of our world. 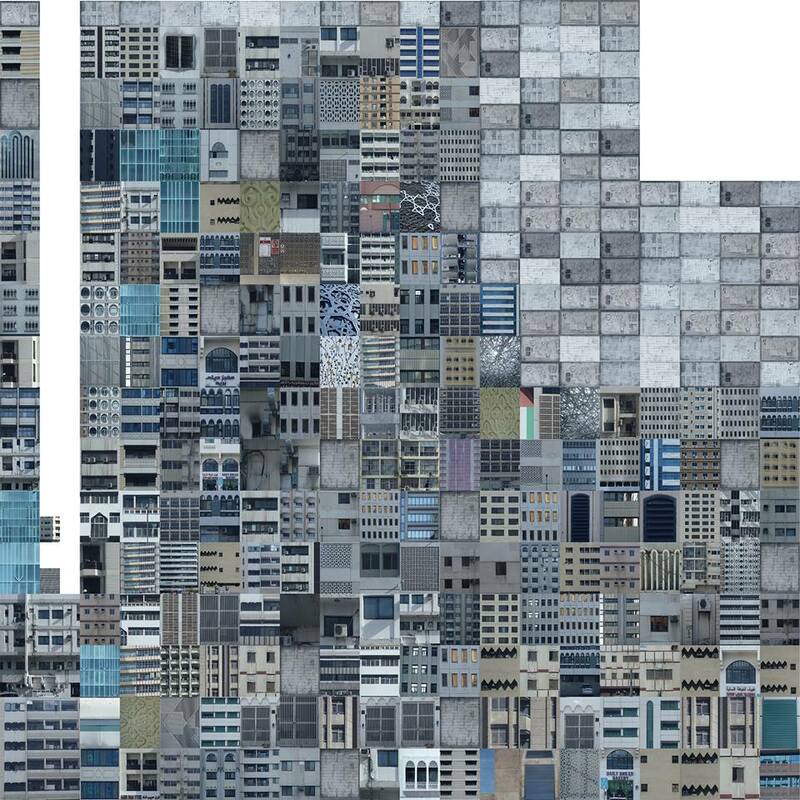 The artist took hundreds of photos of a residential block in Abu Dhabi. Thanks to the photogrammetry process, that allows us since the 19th century to determine the volume of an object from photographs, the artist reconstructed the 3D model of the building. He then used the texture of that model to print it on fabric that, laid on a table, slides like a drapery. We recognize then on this fabric the surface of the city, like a skin that covers a body. All we would need to do is put the fabric on a suitable structure to reconstruct the original building. 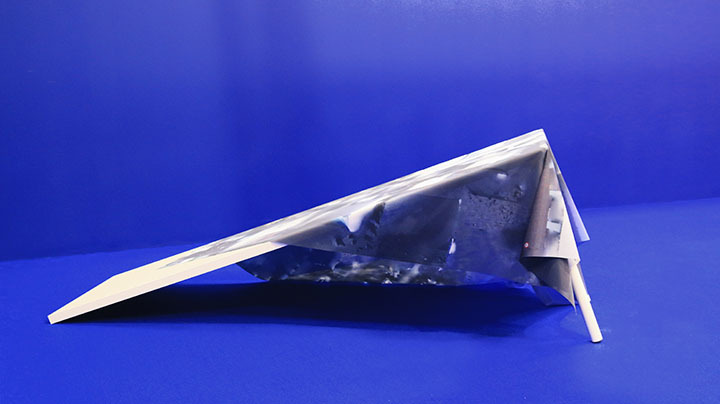 Thus, the result becomes the ghost of a real architectural shape. 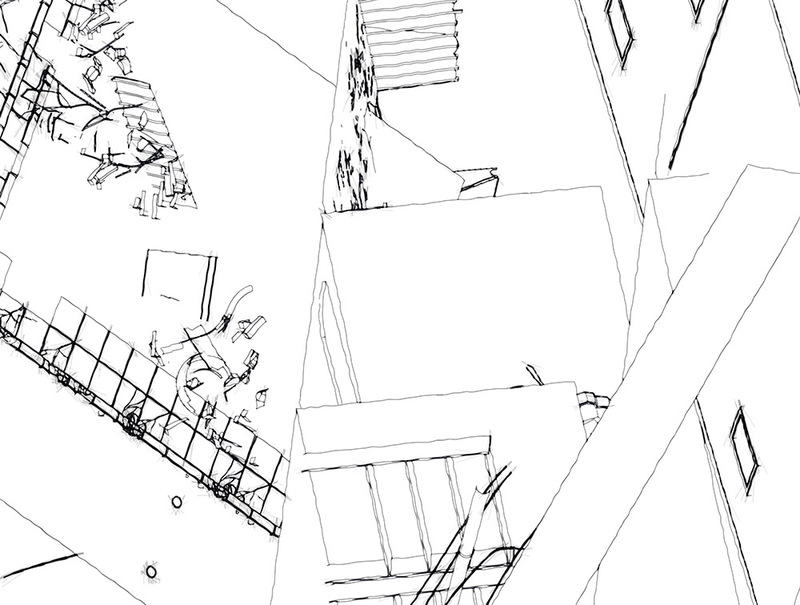 The city is modeled in 3D based on the photographs, then laid down on a 2D surface. This way, we could cut and fold every photograph to recreate the city in a reduced model. This kit of the city constitutes a systematic catalog of urban space. 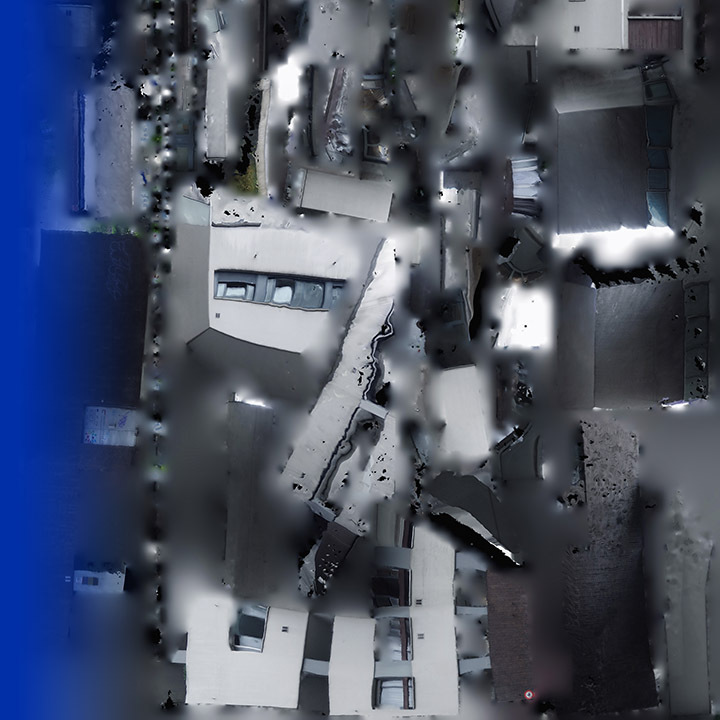 The artist has developed a software that randomly generates fragments of cities where you see streets and buildings, cables and objects. These cities are destroyed. We do not know the cause of their destruction. We only see images in an isometric perspective that are so accurate that they look like architectural blueprints. What architect would draw the blueprints of a destroyed city? Why build a destruction? Aren’t we supposed to destroy in order to build? 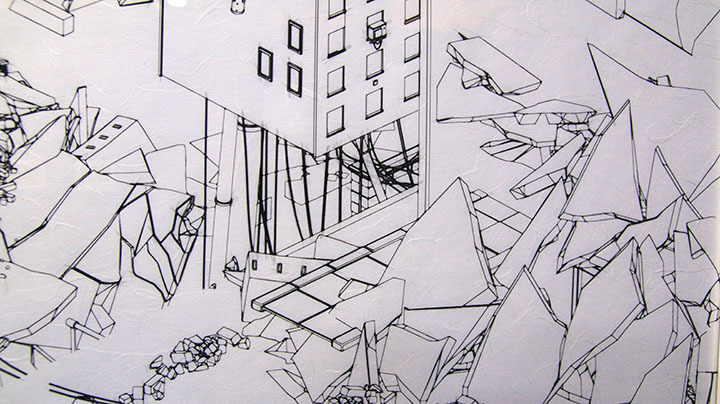 These drawings force us to consider the notion of fascination caused by pictures of ruin and destruction.